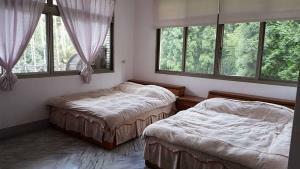 Qian's Garden Inn is located in Lugu in the Nantou County Region, 7 km from Xitou Nature Education Area. Every room is equipped with a flat-screen TV with cable channels. The rooms have a private bathroom with shower. For your comfort, you will find free toiletries and a hairdryer. There is free shuttle service at the property. Providing free private parking, this homestay also features free WiFi. The homestay also offers free use of bicycles. Xitou Forest Recreation Area is a 15-minute drive from Qian's Garden Inn, while Sun Link Sea Forest Recreation Area and Lotus Forest are both a 40-minute drive away. When would you like to stay at Qian's Garden Inn ? This quadruple room features a balcony, soundproofing and seating area. This quadruple room has a balcony, dining area and electric kettle. This quadruple room features a balcony, kitchenette and air conditioning. Please inform Qian's Garden Inn in advance of your expected arrival time. You can use the Special Requests box when booking, or contact the property directly with the contact details provided in your confirmation. Payment before arrival via bank transfer is required. The property will contact you after you book to provide instructions. Please note that this property is entirely no-smoking, no-alcohol and no-betel. Each day we'll check prices and send you an email for your selected dates at Qian's Garden Inn. If you don't have specific dates but would like to check prices for say next weekend or say next month we can check the price too. Click to write a review and share your experience of Qian's Garden Inn with other travellers.